Imagine a highly available business services environment. Highly available business services rely on modern IT operations management (ITOM). What does that look like? You have an availability dashboard structured around business services. 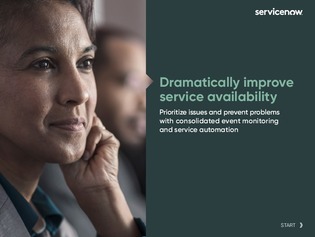 You also have consolidated event monitoring, so you can quickly identify the most serious issues that may impact service performance before they turn into outages. These high-priority issues are then automatically routed and assigned to the right person. New IT Operations Management best practices pioneered by ServiceNow customers have been proven to increase service availability. By developing a service availability strategy, you can address IT issues before they become business problems. This ebook can help you identify where availability challenges exist and improve your ability to analyze, prevent, and address problems before they occur.